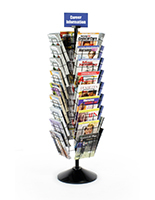 These Wire Racks Can Adjust to Accommodate Different Viewers or Target Audiences! Simply Swivel the Displays Around to See All of the Printed Materials! 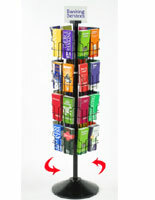 These Wire Racks are Essential Merchandising Tools for Serious Businesses! 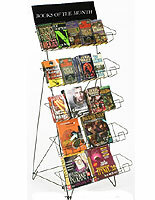 These wire racks are some of the most popular solutions for displaying literature in retail environments. 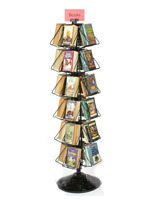 The display stands are crafted from heavy-gauge, wire that is coated with black finish. This way, the wire racks are able to look great while withstanding the typical wear & tear of busy environments. 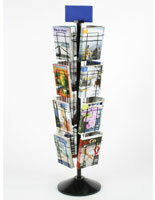 The publication holders feature a height-adjustable post for more viewing options. 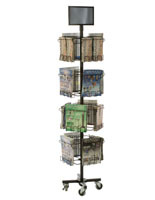 The wire racks are specifically designed for quiet and smooth rotation around the base. 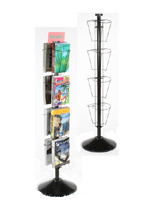 The free-standing displays feature a total of (32) different pockets. 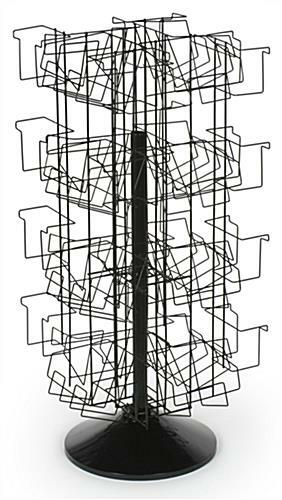 These wire racks are sold at very affordable prices, which provides an extremely practical means of marketing printed materials. The stands can be effectively implemented in waiting room areas, grocery store aisles, convenience store checkouts, and other prominent locations. The displays are shipped unassembled to keep the overall costs lower, but assembly is completed within on a few minutes. Each system comes with the necessary tools and instructions for simple setup. 17.9" x 54.0" x 20.0" x 19.3"
6.6" x 4.8" x 3.0"
7.3" x 6.4" x 5.0"
8.5" x 6.3" x 5.1"